There are two approaches to seting up a solar lighting kit which can both be used at the same time or seprately. In the past, when inverters were less efficient and more expensive most solar lighting was 12v DC or low voltage. 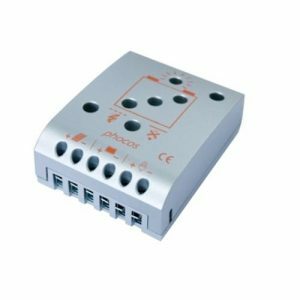 Current advances in inverter technology and mass production mean more solar lighting kits are basd around an inverter and use lower cost mains voltage lamps and components. DC based solar lighting kits need thicker cables, special DC switches and new wiring. An AC solar lighting kit can use readily available switches and existing cabling. If you just want to run a couple of DC lamps in a garden shed/workshop then you’re not going to have much problem but anything more that and you should start thinking about it a bit more. 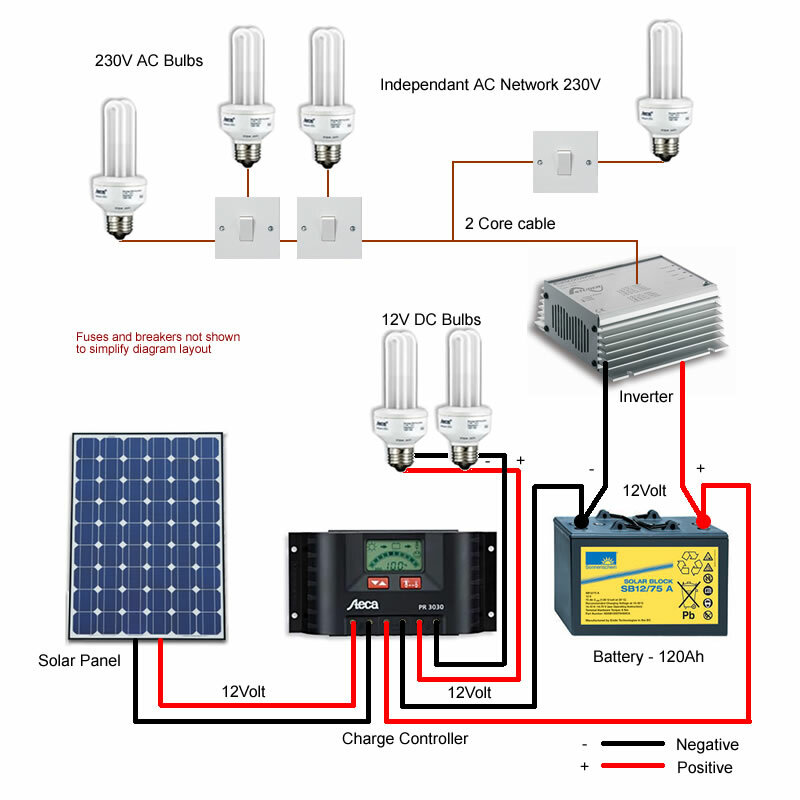 The diagram illustrates the DC Solar lighting connected directly to the Steca PR3030 solar charge controller. 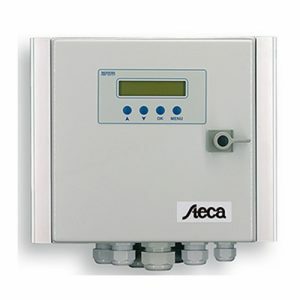 The PR303 controller has an output designed for a DC solar lighting circuit (or a similar low current load) and has a usefull push button switch and a sensor that will turn the output off if the battery voltage low (AKA LVD or low voltage disconnect) The switch is solid state which means it doesn’t have any contacts which means it won’t suffer from any arching problems commonly associated with low voltage high current circuits. It isn’t for an inverter and must only be used for lower power devices! The higher the voltage the less loss there is over longer lengths of wire. This means you can use thinner wire without loosing too much voltage. If is for that reason that the cables carrying mains electricity run at hundreds of thousand of volts. Transmitting 12 Volts over thin cables looses lots of voltage. The last thing you want to do is start wasting all that precious solar power that’s been converted into electricity and stored in your solar battery. 12V or 24V DC has the advantage that it’s relatively safe unlike 230V AC which is most definitely not. When choosing or designing your solar lighting kit make sure you consider above points. Think long term because once you’ve started using solar lighting with perhaps one or two bulbs we bet you a pound to a pinch of salt you’ll want to illuminate the entire neighbourhood in the near future!